v) Quaid-e-Azam joined the All India Muslim League in the year A.D.: . 2.i) State the Social Impact of Islam on South Asia. Islam and Hinduism basically differ in their attitude towards life. Islam strongly believes in the concept of ‘Tauheed’ and insists on the equality of mankind before law. It does not entertain any distinction among the people on the basis of such inhuman principles as caste, creed and social status. Hindus, on the other hand believe in the multiplicity of gods and is based on the unethical caste system which has divided society into privileged and underprivileged classes. Islam came as a blessing for the oppressed sections of India whose life had become miserable because of the deep rooted caste system. Islam brought a.new way of life for them which ! !ley had never seen before in the Hindu society. The respectable way of life, shown to them by Islam, gave them a feeling of being human beings. Islam infused a different thinking and sentiments among the people of the sub-continent. 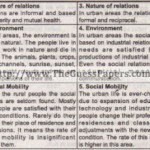 ii) Write about any Two important Natural Resources of Pakistan. Natural Resources: The resources endowed by the nature to the country and the people are called National Resources, e.g., Mineral resources, rivers, forests and animals. Agricultural lands hold key to development and prosperity of a country. The rate of development and prosperity of a country depends on efforts to make use of it. Effective management and human efforts are needed to avail them. Modem technology is also required to make use of it. Mineral Resources: Pakistan is blessed with considerable mineral resources. Some of them are explored but much remains to be done for the search for more. Some important resources are iron ore, Chromite, Gypsum, Sulphur, Coal, Uranium, Gas, Oil etc. Rivers: The river system of Pakistan is consisted of Indus and other associated rivers. We have a well- defined Canal system. It is used for Agriculture where it is the backbone of agro-economy. It is also a cheapest source of hydroelectric Power generation. Forests: Normally 25 percent area of a country should be covered with forest. But in Pakistan it is only 4 to 5 percent. are also used for agriculture and transportation. They are a source of foreign exchange. Their proper breeding requires planning and care. Animal husbandry and colleges of research are established to breed and cure useful species of animals. Department of Live Stock also provides Support System for. raising animals both privately and through Government Projects. Fisheries: It is also a source of food and income. Department of fisheries also encourage private farmers to invest in this field and add to personal and national wealth. Soil: The soil of Pakistan belongs to dry group having high calcium carbonate content and deficient in organic matter. These soils are generally fertile due to process of formation’ .The type of soil formed is a function of topography, climate, vegetation, and the parent rocks from which the soil material transported and deposited by running water is known as alluvial which that transported and deposited by winds form Aeolian soil .Pakistan is an agricultural country having alluvial soil brouqbt by the rivers. iii) Highlight the Geographical Importance of Pakistan. Pakistan occupies a position of great geo-strategic importance. It has excellent links with Iran and China and trying to maintain healthy relations with India and Afghanistan as well because they are also its neighboring countries. Thus Pakistan has excellent air Iir.ks with other countries. However, the location of Pakistan occupies a ve’Y favorable position for trade with the rest of the world. It has about 1050 kilometers coast line and almost all international airways serve the Quaid-e-Azam International Airport (Karachi) and Allama Iqbal InternationalAirport (Lahore). 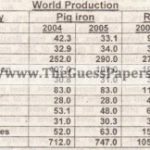 iv) What is the importance of Agriculture in the economy of Pakistan? Pakistan is basically a farming community. About 70% of its population is living in rural areas and nearly 50% of them engaged in farming, livestock and agro-based industries. However, Agriculture sector plays a vital role in the economic development of a country it is confirmedand supported by the following facts. 1. The GDP growth rate in Pakistan is mainly dependent upon the growth rate in agriculturesector. 2. Agriculturaldevelopment is essential to curtail inflation. 3. Aqriculture is the main source of provicijngmanpower of various sectors of economy. 4. The agriculture sector is the main source of foreign exchange eamings in Pakistan. 5. The agriculture sector is successfully meeting the food requirements of over 16 crore persons in Pakistan. v) Explain the Two Nation Theory. The Two Nation theory in its simplest way means the cultural, political, religious, economic and social dissimilarities between the two major communities, Hindus and Muslims of the Sub Continent. These differences of out look, in fact, were greatly instrumental in giving rise to two distinct political ideologies, which were responsible for the partition of India into two independent states. There are a few factors, which split the inhabitants of the Sub Continent into two nations. vi) What do you know about the Aligarh movement? After War of Independence 1857 A.D Sir Syed’s first and foremost objective was to modemize the Muslims following the Western cultural values that could create friendly atmosphere for the two communities. 2. To induce them to gei jobs and other facilities under the new government. To him, this was the only way for the Muslims to prosper. 3. To persuade Muslims to abstain from imitational politics Syed Ahmad Khan’s Aligarh Movement played a significant role to bring about an intellectual revolution among the Indian Muslims. Thus Aligarh Movement succeeded in achieving its major objectives and boosted up the depressed Muslim community to the real status of nation. vii) Write the importance of the Objectives Resolution 1949. This resolution is of fundamental importance in the history of constitutions making in Pakistan because from the first constitution of 1956 till the constitution of 1973 (present constitution) whatever constitution was framed it was based on this Objectives Resolution. At the time it was passed, Mr. Liaquat Ali Khan called it “the most important occasion in the life of this country, next in importance only to the achievement of independence”. It contains those steps and principles which were to be taken for the fulfillment of the basic aim of the freedom struggle that is the establishment of an Islamic society in Pakistan. Hence, it is a significant document in the constitutional history of Pakistan. This resolution is considered an important event in the constitutional history of the country. It was accep d Of all classes of people. It provided a guide line for the future cons itu Ions of Pakistan which were passed in 1956, 1962, and’1973. It consisted of such principles which revealed that character of .constitutionwill be Islamic. viii) State the importance of Urdu Language in National integration of Pakistan. Being the National language of the country, it is the bindil\9 force in different parts of Pakistan. Ur u serves as a means of communication. People living in different provinces realize that in spite of speaking different languages, they are joined together by one national language which is the heritage of all. It IS also an important factor for achieving unity and brotherhood among all the provinces. Write the aims and objectives of the establishment of Pakistan. 1. Religious Causes: In the Subcontinent, the Hindus and the Muslims had been living together for many centuries, peacefully, but-after 1857 the Muslims were treated very badly by the Hindus. The Hindus, believed in caste-system whereas the Muslim did not. The Hindus worshipped gods in their temples -whereas the ‘Muslim believed in One God. Their religious heroes and religious festivals were different. The Hindus hated the Muslims. Hence, the Muslims thought of having a separate homeland where they could live according to the tenants of Islam and flourish their religion. 2. Urdu-Hindi Controversy (18&7): Though Urdu was spoken, written and understood throughout India, yet the Hindus did not like to adopt it as the national language, because it was written in Arabic script. They wanted to adopt Hindi written in Dovanagri script. This language controversy started in 1867. Sir Syed supported the cause of Urdu, but unfortunately, in 1900, Hindi was adopted as the national language. The Muslims protested and were suspected. They thought that it was an assault at their culture. Shudhi movement stalled in 1922 by Swami Shardhanand meant that all the Muslims of the Subcontinent should be converted to Hinduism. At this time, the Hindus made speeches which were against Islam. Sanghtan movement was started by Pandat Madan Mohan Malvia. The object of the Sanghtan movement was to end the internal feuds of the Hindus and to organiz~ them into a powerful nation to fight successfully against the Muslims in the time of need. These movements brought an irreparable loss to the Hindu-Musim unity and shattered it out rightly. 5. Hindu Society: Hindu leaders used to say that the Muslims were foreigners. India belonged to the Hindus. If the Muslims wanted to live· there, they should live as subordinate. The Hindus should organize themselves to be powerful and fight the Mus rms. They should convert a the Muslims to Hinduism. Those who refuse shoukf be turned out of India. In short, these movements aeated a gulf between the Hindus and the Muslims. Now the Muslims thought that they should have a separate homeland. 6. Partition of Bengal (1905-11): The Bengal was divided in two provinces in 1905 by Lord Curzon. This brought prosperity for the Muslims in East Bengal. The Hindus’ trade and interests got a set back. So, they lodged protest against the British Government to cancel it • .They took out processions, hekf meetings, raised slogans and violated law and order. They said that the Eastern province had been created by the British to please the Muslims and to establish their rule over them again. Clashes started between the Hindu and the Muslims. Now the Muslims thouqht that they should have a .separate and an independent homeland. 7. The Muslim League (1906): Hence, the Muslim political personalities after the last session of the uhammadan Educational Conference held a secret meeting and in it, established on 30th of December 1906, the All India Muslim League at Dhaka. This Muslim League worked hard and paved a political way for the Muslims for a separate homeland. 8. The Simla Delegation, 1906: On 1st October 1906, a deputation of 35 uslim scholars and politicians, led by Sir Agha Khan along Mohsin-ul-Mulk, Vaqar-ul-Mulk, Sir Salim Ullah Khan, Hakim Ajarnl Khan, Syed AH Ima ,Mian Muhammad Shah Din, Mian Muhammad Shaft, Malik Umar Hayat Tiwana and others met the Viceroy, Lord Minto at Simla and demanded separate electorates and representatio in the Imperial Legislative Cooncil according to their population. quota in Civil Services, judge-s ip in the High and Chief Courts and funds for the establishment of a Muslim University. had been professing that the Indians were one nation. Mahatma Ghandhi often tokf the Hindus that they and the Muslims were two eyes of India. They were one nation. They coukf not be separated. 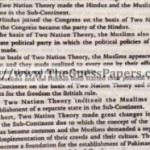 Sir Syed Ahmad Khan in e last decade of 19th century said that the Hindus and the Muslims were two separate nations. A1lama Muhammad Iqbal. the Quaid and Ch. Re mat A1ifavoured it. I was this theory upon which the edifice of Pakistan was constructed. 10. Nehru Report (1928): In 1928 the Congress appointed a committee of lawyers to prepare a plan fo the future constitution, headed by Mati La; Nehru father of Jawahar Lai ehru. This report turned down all Muslims’ demands. Some Muslims wanted changes in it. but no attention was paid to it The gulf of differences between the Hindus and the Muslims was so widened from now onward that it could not be bridged until the dawn of independence for the Musiim. 11. 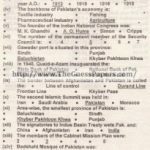 The Fourteen points of Quaid-e-Azam (1929): In reply to the Nehru report. Quaid-e-Azam placed before the Muslim league in Delhi his Fourteen Points in which he demanded proper representation of minorities in the Central legislative Assembly. He also demanded elections on the basis of Muslims representation in the Civil Services and thus these Fourteen Points paved a way for a separate homeland for the Muslim. 13. Pakistan Resolution (1940): On 23rd of Merch 1940, the All India Muslim league at its 34th annual session, ,demanded under the presidentship of M. A. Jinnah a separate, sovereign and an independent homeland for the Muslim of India. in Minto Park. Lahore. 14. 3rd June Plan (1947): On the third of June 1947, the British Government announced that India would get full freedom into Hindu majority and Muslim majority areas from 15th August 1947. The new independent states were to be Bharat and Pakistan. 15. The Congress Ministries: The Congress Ministries tried to establish the Hindu rule in their provinces. They tried to destroy Muslim culture, language and even their educational system. It all brought distrust In the minds of the Muslim. 16. Band-e-Matram: The Hindus could not tolerate the existence of the Muslims in India. So, they stalled many anti-Muslim movements. Band-e-Matram sung in the legislative Assemblies was full of anti-Muslim feelings and sentiments. Finally, it was adopted as the National Anthem of India. This showed a hatred of the Hindus. Had the Hindus not stalled the an~slim movements, Pakistan would have not been created. It is. aD due to their step-motherty treatment which was exposed in Band-e-Matram, Shudhi and Sanghtan movements, that Pakistan was created. 17. Social Causes: The Hindus and the Muslims had two different and distinct societies. Their social customs and conventions were different. They neither inter-married nor inter-dined. Their thoughts and feelings were also separate. Their death and birth ceremonies and rites were different. They could- not be united. Both wanted to have their specifications. their OWl’ societies and separate entities. The Hindus believed il’l caste-system whereas the Muslims believed in social justice and equity. These two different societies could not manage to merge into one and finally this separation of two distinct societies led to a separate homeland for the Muslims. 18. Hindu Majority: In India the Hindus numbered 250 million and the Muslim 100 million. The Hindus wanted to have Hindu Raj after the British People left India. They wanted to dominate the Muslims. Quit-India movement was a clear example of it. song against the Muslims. Likewise the Shudhi and the Sanghtan movements were started to undo the Muslims. The Congress turned down every demand of the Muslims. The communal riots ‘and atrocities of the Congress ministries led to the Pakistan Resolution of 1940. 20. The British Distrust: The British always distrusted the Muslims. They wronged them in every field of life and became more hostile after the War of Independence, 1857. The Muslim majority areas were left undeveloped. The Muslims lagged behind in education, trade, commerce and industry. They did not enjoy their due share in civil services. Jinnah on 15th August, 1947. 4. Describe the salient features of Pakistani Culture . 1. Religious Uniformity: Pakistan came into existence to provide its people a system of life based on Islam. The people, in spite of some differences of languages, customs and traditions, commonly follow one religion of Islam. This is the religion, which is professed and practiced by all people of Pakistan. 2. Literature and Poetry: Literature is an important aspect of our cultural life. Most of our poets reflect Islamic code and trend in their poetry. They gave the message of love and brotherhood. The Radio and Television also influence the cultural aspect of our society. They broadcast cultural programmes and drama which present our social values. Similarity of thought amongst poets and writers of all regions is an important factor of our cultural life. Modem poets and prose writers . have also started writing about important issues such as democracy, poverty, slums, the status of women, the evils of the dowery system for the girls’ parents etc. 3. Languages: Pakistan is a multi lingual country and a number of languages are spoken in Pakistan. In spite of the different languages Urdu is spoken and understood in all parts of Pakistan. Being the national language, it is the media of communication between all regions of Pakistan, Punjabi, Sindhi, Pushto, Balochi, Brahavi and Kashmiri are the regional languages of Pakistan. Islam and mysticism provide a common heritage to all these languages. Most of the regional languages have a common vocabulary, with Arabic, Persian and Turkish and are written in Persian transcript from right to left. 4. Film and Television: Traditionally, the government-owned Pakistan Television (PTV) has been the dominant media player in Pakistan. However past decade has seen emergence of several private TV channels News, entertainment) such as the GEO TV and the ARY channel. Traditionally the bulk of TV shows have been plays or soap operas – some of them critically acclaimed. Various American, European, Asian and Indian TV channels and movies are available to a majority of the population via Cable TV. An indigenous movie industry also exists in Pakistan. 5. Music: Music in Pakistan forms a part of its culture life. Pakistan music is represented by a wide variety of forms. It ranges from traditional styles (such as Qawwali) to more modern forms that try to fuse traditional Pakistani music with western music. Popular forms of music also prevail, the most notable being .Film music. In addition to this are the diverse traditions of folk music. 6. Dress: Dress is an important manifestation of culture. Dress in a Muslim society like Pakistan is designed and intended to cover human body. So, people of Pakistan prefer to wear simple dresses according to their climate. The regional dresses of Pakistan under go changes in the light of local traditions, economic conditions, way of living and wealth in the region. Westernization has also affected the dressing in Pakistan, particularly in the cities where suit or shirt and pants or jeans are widely used. Women’s dress in Pakistan generally comprises shalwar, qameez and dupatta. They prefer bright and gaudy colours and rich designs. A shawl may also be used instead of dupatta. 7. Food: The common food is very simple. Meat, vegetables and pulses are used with bread of wheat or rice. Delicious rice food is commonly prepared. Vegr tarian food is preferred diet among the majority. Milk, fluid curd, gree~ tea, cold drink or pure water is use as a beverage. 8. Social Customs: The social life in Pakistan is very simple and very easy to understand. Customs and usage are important factors in the social life of Pakistan. Social customs and traditions reflect Islamic touch. From birth to death social customs and ceremonies are performed by individuals varying according to their economic and social standing. Religious gatherings, marriage ceremonies, get-together, domestic parties and functions expose our social customs. Similarly for most families the birth of child is a joyful occasion. 9. Mixed Culture: Pakistani culture can be called as “Mixed Culture”, Although the majority of people in Pakistan are Muslims by birth and faith, there is a strong influence of Hindu culture on the present Pakistani culture. The shadows of this influence are quite visible on the marriage ceremonies and festivals like “Basant”. Dowry Systems and heavy expenditures on the marriage of girls is done, which is inherited from Hindu society because in Hindu society there is no share of women in the inheritance of their parents. Pakistani literature and art also took influence from British culture. The English dress, diet, and especially English dance and pop music are very common in the urban middle and upper class of pakistan. 10. Male Oriented Society: Pakistani society is a “Male Oriented Society”, where they are given full protection and great respect. The family is headed by a male member, usually the oldest male member of the group. He guides the other members and in most cases he is the sole source of income for other members of the family. Old people are given positions of prestige, honor and respect in Pakistani culture. 11. Arts and Architecture: A glorious heritage in architecture is a distinguish feature of Pakistani culture. The iconoclasm of Islam has given a characteristic form and pattern in the use of elegant designs, based on geometric figures and floral forms borrowed from nature. Even outside Karachi, at a distance of about 30 kilometers at Chaukhandi, there are oblong shaped graves with geometrical designs. In Thatta, there is the Jamia Masjid built by Shah Jahan which is covered with the most fascinating glazed tile work. In Lahore, the Shah Jahan Masjid, Shalimar Garden, Badshahi Masjid, Shahi Qila and many such graceful buildings are a living proof pf tne excellent Mughal architecture. 12. Handicrafts and Craftsmanship: It has been aptly said that Pakistan’s early history is moulded in ceramics, welded in metals and woven in textiles. Embroidery, leather works, glazed pottery, wood work, carpet making, metal crafts, ivory are the essential parts of our culture. Pakistani handicrafts are gaining popularity in the world market day by day, as Pakistani craftsman are considered as the best in their craftsmanship. They are known for the high quality works which is very popular in foreign countries. Pakistan is famous for its high standard items of glass, silver, wooden furniture, pottery, marble goods and things made of camel skin. 13. Sports: The most popular sport is Cricket. Pakistan has won several important international Cricket events, including the pinnacle of Cricket, the World Cup in 1992. Hockey is also among the popular sport in Pakistan. Squash is another sport that has a large following. Football or Soccer is played in Pakistan as well. Tennis is also very popular and Pakistanis compete in various international events. Athletics Pakistanis compete in various athletic events including Swimming. Other popular sports followed on TV include Formula-One motor racing, Basketball (NBA), Rugby, Table-Tennis, Chess, Badminton. In short, Cricket, Hockey, Football, Kabbadi, squash, badminton, and wrestling are the major sports in Pakistan. 14. Education: Education contributes a great deal in developing national character. Educational system plays a vital role in the formation of culture, unity and solidarity of a nation. Two systems of education exist in Pakistan. The traditional system teaches children religion, Urdu, Arabic and some Persian. Most traditional schools are located in mosques whereas the other more prevalent system of education is based on a Western pattern introduced by the British. 15. Islamic Rituals and Religious Festivals: Islamic rituals and festivals play an important part of our culture. The rituals and festivals are observed with unusual enthusiasm. Obligatory prayers, fasts during the month of Ramadan and the payment of Zakat prescribed by lslam are being observed almost everywhere. Statistics reveal that Pakistanis’ attendance at Hajj is usually very high. The zeal and enthusiasm with which Pakistani families celebrate religious festivals is a inspirational spectacle. Eid-ul-Fitr and Eid-ul-Azha are our two main religious festivals. They are celebrated with great happiness throughout the country. 16. Ulema, Mushaikh and Sufi Poets: Ulema, Mushaikh and Sufi Poets occupy highly honoured places in Pakistani culture. Sufis like Lal Shahbaz Qalander, Data Ganj Baksh, Shah Abdul Latif, Sachal Sarmast, Baba Buleh Shah, Hazrat Sultan Bahu and Waris Shah rendered meritorious services for the spread of Islam in the Sub Continent. These great men are an asset of our cultural history. Their services for Islam and Muslims of the sub-continent cannot be forgotten at any cost. Conclusion: The Pakistani Society runs around the reigns of Islam. So it may be said that Pakistani culture represents the true picture of Islamic culture. In short, Pakistani Culture is a strong culture. It has its roots in old traditions and it changes according to the existing demands because culture is not a product, it is a continuous process. 5. Discuss the fundamental principles of the Foreign policy of Pakistan. 1. Maintenance of territorial integrity. 2. Maintenance of its political independence. 3. Acceleration of social and economic development. 4. Strengthening its place on the globe. 5. Keeping cordial and friendly relations with all countries. 1. Protection of freedom and Sovereignty: Pakistan came into being after great sacrifices of millions of Muslims. Like any other country, she also considers with deep regard the need for preservation of its independence and does not allow any country to harm its freedom. Therefore, the principle of protection of independence and sovereignty is the comer stone of Pakistan’s Foreign Policy. 2. Cordial Relations with Muslim Countries: Pakistan always tries to establish cordial and friendly relations with Muslim countries. It has always moved its concern against Israel, India and U.S.S.R capturing Palestine, Kashmir and Afghanistan respectively. She has shouldered high responsibilities and used her influence for safeguarding the rights of the Muslims. Pakistan is also an active member of the Islamic Conference. 3. Non Interference in Interference Affairs of Other Countries: Pakistan has sought to establish normal and friendly relations with all countries especially Its neighboring countries, on the basis of universally acknowledge the principle of national sovereignty, non use of force, non-interference in the internal affairs of states. 4. Implementation of U.N Charter: Pakistan’s policy is to act upon UN charter and to support all moves by the UN to implement it Pakistan has been the member of UN since the year of its birth. 5. Promotion of World Peace: Pakistan policy is to promote peace among nations. It has no aggressive designs against any country. Neither does it support any such action. Pakistan has always held that the international disputes should be settled through negotiations rather than non-battlefield. 6. Non-Alignment: Pakistan follows the policy of Non-Alignment i.e. to keep away from alignment with any big power bloc, and avoids taking sides in the cold war. H has also given up its association with SEATO and CENTO and was included in NAM in 1979. 7. Support for Self – Determination and Condemnation of Racial Discrimination: Pakistan is a staunch supporter of the right of self-determination and has been in the fore front of efforts to eliminate colonialism and racism. H has advocated the right of self determination of Kashmir. 8. Nuclear Non-Proliferation and Disarmament: Pakistan is deeply conscious of the fact that international peace and security cannot be achieved and sustained in the world with arms. Disarmament is the imperative condition for truly durable peace in the world. Pakistan has a vital stake in promotion of disarmament both in the nuclear and conventional fields. it is included in the principles of its foreign policy that a collective endeavor by counties at the regional level to promote disarmament and enhance security at the lowest possible level of armaments is an indispensable result to their advocacy of global disarmament. Pakistan has become the member of the the brutish Commonwealth with the time of its establishment. In addition it is the member of united nation (U.N). Non-aligned Movement (NAM), Organization of Islamic conference (OIC), Economic Cooperation Organization (ECO), South Asian Association for regional Co-operation (SAARC) Association of South East Asian Nation (ASEAN), and D-Eight. Being a member of International organizations the objective of Pakistan are to struggle for world peace, to unify the muslim countries and to promote regional co-operation.